I shoulda gave him a cigarette. Now there is an adult swim show that I would watch! Hey Vincent, thanks. It's funny because no thought went into it. Am I thinking too much? Ha! Sadistic! Can't say he wasn't warned! This is great, like how Casper would be when he gets to the end of his rope. lol this one definitely isn't a friendly ghost! 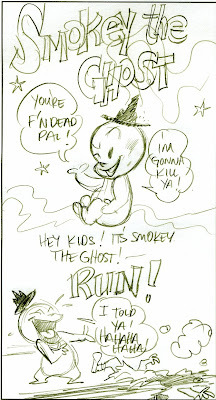 Ah yes, Smokey, Casper's evil twin...What happens when you kill a ghost? Just wondering out loud.